Why fear the things that go bump in the night when you can become one? 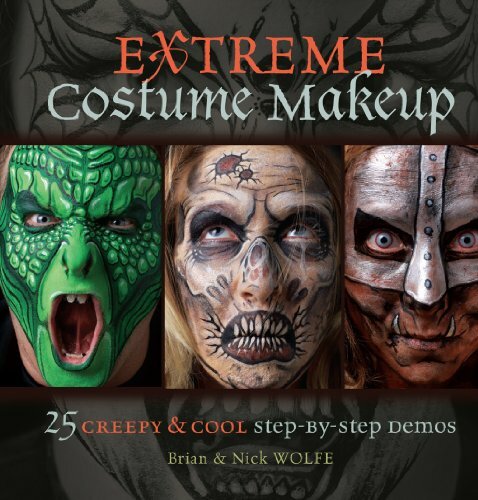 World-renowned special effects artists Brian and Nick Wolfe will teach you how to transform everyday faces into an army of ghastly personas–from raging fire demons and disfigured zombies, to blood-spattered vampires and otherworldly aliens–with simple face-painting techniques. Learn the secrets to creating believable, creepy costume makeup with readily available materials, easy-to-follow instruction, and a monster-load of cool inspiration for everyone from novices to more experienced face painters. Award-winning techniques with up-close photo references for creating full-face works of freaky, wearable art. Learn the basics and then follow demos to turn your friends into everything from insects and werewolves, to cyborgs with splitting heads. Get the tricks to painting strikingly real warts, wounds, fangs and other ghoulish features to take your own original designs to the next level. Get ready to surrender to your dark side…at least until the paint washes off.